SNL Ridicules Laura Ingraham's "Feel Facts" [VIDEO] - Joe.My.God. Ingraham is so cartoonishly awful that her show has graduated from object to subject, and this week Kate McKinnon performed essentially an entire episode of The Ingraham Angle, complete with an opening editorial monologue, a segment with Jeanine Pirro, and interviews with Mark Zuckerberg, Marcia Fudge, and “the self-proclaimed ‘Vape God,’ ” Tom Scibelli. 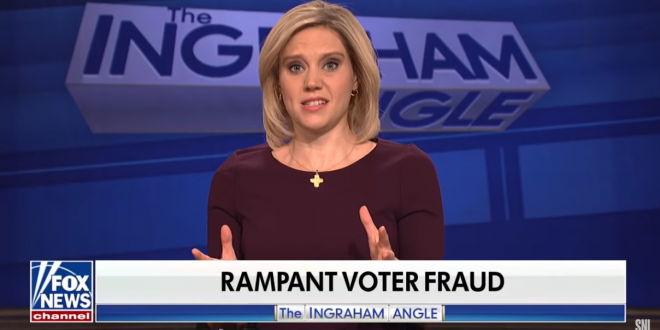 The highlight is the opening monologue on voter fraud, which provides a quick primer in how Fox News floats toxic ideas while maintaining plausible deniability.